The large hall was created from the inside of the old hay-barn. It uses all three levels for a height of eight meters. The plan is completely open with the effect of a changeable perspective. Also changeable is the light that permeates from skylights and east and west rose windows, providing an exceptionally bright natural luminosity. The hall can be rented for many kinds of situations. 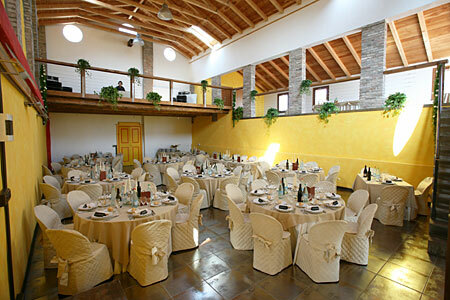 It is ideal for weddings, theme nights, private parties, educational courses and activities of all kinds. In the middle of the season it is also possible to organize events outside thanks to the ample terrace: 250 square meters of river-rock paving stones. hall: 13 X 8 m.
raised area: 13 X 4 m.
mezzanine: 4,5 X 8 m.